The National party is looking to make significant changes to the country’s welfare system, with new rules to require benefit recipients to look for work. 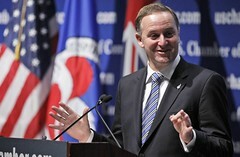 At a press conference in Hamilton on October 1st the New Zealand Prime Minister John Key revealed the National Party’s plans for a revised welfare system. According to the Prime Minister, the welfare system changes are aimed at breaking the cycle of “inter-generational” welfare dependence and long-term welfare recipients. Ultimately, the Party hopes to cut NZD 1 billion from national welfare expenditure over the next four years, by encouraging approximately 46 000 extra taxpayers to reenter the workforce. John Key proposed that the current welfare system be dropped entirely and replaced with a new scheme, consisting of three primary benefit types. Recipients would be classed into one of three benefit groups based on their ability to work and situations. Under the new rules, sickness benefit recipients will be required to seek part-time or full-time employment, with exemptions only granted to individuals who are terminally ill or with a seriously hampered ability to work. Solo parents will be required to look for part-time employment when their child turns five, and full-time employment when their child turns fourteen. The employment benefit would be replaced with a “jobseeker support” system, aimed at bringing people into the workforce. The Prime Minister said that the benefit rates will not be altered under the new system, and future payments will be adjusted to keep pace with inflation.